Since her death in 1922, Sarah Winchester has been perceived as a mysterious, haunted figure. After inheriting a vast fortune upon the death of her husband in 1881, Sarah purchased a simple farmhouse in San José, California. She began building additions to the house and continued construction on it for the next twenty years. A hostile press cast Sarah as the conscience of the Winchester Repeating Arms Company-a widow shouldering responsibility for the many deaths caused by the rifle that brought her riches. She was accused of being a ghost-obsessed spiritualist, and to this day it is largely believed that the extensive construction she executed on her San José house was done to appease the ghouls around her. But was she really as guilt-ridden and superstitious as history remembers her? When Winchester's home was purchased after her death, it was transformed into a tourist attraction. The bizarre, sprawling mansion and the enigmatic nature of Winchester's life were exaggerated by the new owners to generate publicity for their business. But as the mansion has become more widely known, the person of Winchester has receded from reality, and she is only remembered for squandering her riches to ward off disturbed spirits. 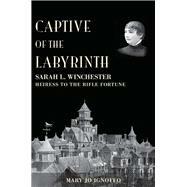 Captive of the Labyrinth: Sarah L. Winchester, Heiress to the Rifle Fortunedemystifies the life of this unique American. In the first full-length biography of Winchester, author and historian Mary Jo Ignoffo unearths the truth about this notorious eccentric, revealing that she was not a maddened spiritualist driven by remorse but an intelligent, articulate woman who sought to protect her private life amidst the chaos of her public existence. The author takes readers through Winchester's several homes, explores her private life, and, by excerpting from personal correspondence, gives the heiress a voice for the first time since her death. Ignoffo's research reveals that Winchester's true financial priority was not dissipating her fortune on the mansion in San José but investing it for a philanthropic legacy. For too long Sarah Winchester has existed as a ghost herself-a woman whose existence lies somewhere between the facts of her life and a set of sensationalized recollections of who she may have been. Captive of the Labyrinthfinally puts to rest the myths about this remarkable woman, and, in the process, uncovers the legacy she intended to leave behind.